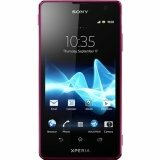 Sony Xperia TX LT29I Unlocked Android Phone--U.S. Warranty (Pink) by Sony at DJ Luu. MPN: 1271-8961. Hurry! Limited time offer. Offer valid only while supplies last.